Let’s meet one of our fundraisers, Brandon Desiderio of Pennsylvania, through this Q and A session with FundMyTravel. What was your inspiration in taking up Journalism? I’ve been writing since I was six or seven. Like most kids, I wanted to be the next great novelist for a while – then a mixture of reality and rethinking of that objective made me change course. I kept asking myself, “Why do you REALLY want to write?” And I realized that it wasn’t about the fame, or the fortune, o r the 60,000-word format. ; rather, it was about my desire to create… and to create critically, importantly – for the benefit of others. What are you looking forward to most about this experience? Being immersed in a whole different culture. I’ve been abroad once before, to San Lucas Tolimán, Guatemala, for one week last spring. It was an inspiring and eye-opening experience, and reignited my passion to live and work abroad one day. When I heard about this program in Jerusalem, it instantly clicked – through my studies I had been learning more and more about the Arab Spring conflict in the Middle East, and as editor-in-chief of my college’s newspaper, I’ve covered aspects of the ongoing conflict and plan to cover it more. Jerusalem would bring countless other opportunities to continue this passion, particularly alongside professional journalists who’ve been covering the Middle East for years. What preparations are you making for this trip? Lots! The biggest issue I’m faced with, unsurprisingly, is securing funding. I’ve applied for several grants and scholarships, and continue to seek out other avenues of funding as I discover them. Luckily people have been very receptive and supportive, particularly family friends and even my professors, all of whom have donated themselves to my FundMyTravel campaign! It’s very humbling and gratifying to know that such great, caring people are around me. It’s so easy to forget that. What do you think are the benefits of studying abroad in Jerusalem? I’d be underestimating this opportunity by reducing it down to the idea that it’s a current concern, that Israel-Palestine relations and Israel-Arab relations overall have been tense, and this tension portrays the critical nature of keeping up-to-date with the area and recognizing that its struggles are ours, that even Israel-Iran conflicts hit home. But I say that’s an underestimation given the historical, cultural, spiritual, and religious importance of Jerusalem. It’s such a rich area, with so much to offer, that it’s not fitting to boil it down just to a journalistic analysis of its politicized nature. There’s so much to it. I’d be willing to argue, though, that everyone should study abroad in an area as significant as Jerusalem – or at least pay a visit and stay outside of the comfort of a three- or four-star hotel. When we go abroad, we Americans think of vacationing. But opportunities like these, areas like these, offer so much more than tourist amenities and sightseeing. It’s time we revisit this truth. 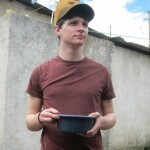 Let’s help bring Brandon attend the Journalism class he is taking in Jerusalem through his FundMyTravel campaign here.